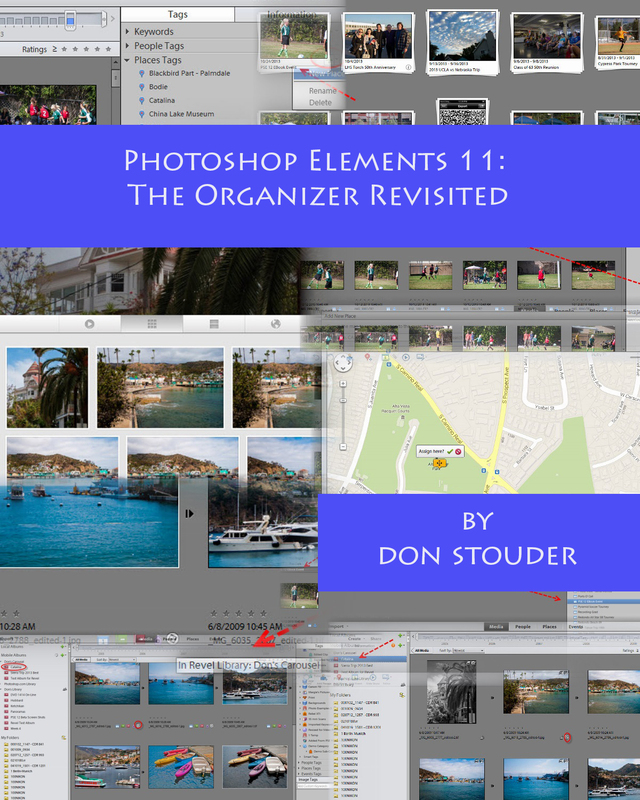 Welcome to my new eBook, Photoshop Elements 11: The Organizer Revisited. This eBook will help you have more fun working with your photo images and video clips. Notice the title specifically includes the word Organizer. This eBook focuses almost exclusively on the Organizer in Photoshop Elements 11 and how to use it effectively. The last chapter in the eBook, overviews the changes to the Organizer in Photoshop Elements 12, which are relatively minor. You can get the eBook for only $9.99 from Amazon for either the Kindle or iPad by clicking on this Kindle Store link. Take a peak inside the eBook by Clicking Here. There is a great full-text search capability implemented on the iPad version (and most likely on the Kindle as well) that makes it very easy and quick to locate exactly the topic you want. There simply is no other book on the market today, that covers the Organizer in Photoshop Elements 11 so thoroughly. My earlier eBook, Photoshop Elements: The Organizer, which covers earlier versions of the program, up through Photoshop Elements 10, is also available on Amazon. Don, Does your TUSD in Sept. use P.S.E. 10 for ORGANIZER ? Unfortunately no, Gerry. Also, as I indicated in my email and description, I will be teaching the class somewhat differently for the fall term. That being said, even though TAE still only has PSE 7, the differences in both the Organizer and Editor from PSE 10 are not major. All of my handouts use PSE 10 figures, as well as my eBook. Rudy, it’s available from Amazon.com from their Kindle Store. You can buy the iPad version from there as well. Here is the link. Copy/paste it into your browser. Thanks for asking! Just might check that out. Thanks. I might very well do that. Thanks. Please call me. Need to see you or talk to you regarding my Photoshop (v. 11) reorganization.